Well, well, well hello there, husband to be. How does it feel to live through your last days of freedom? Jokes aside, when we’re talking about bachelor parties, probably every man in the world knows what traditional bachelor party is all about: booze, strippers, strippers aaaand strippers. Boring. As our fellow better halves would say, that is SOOO last season. It is time for a little upgrade and starting a new tradition. 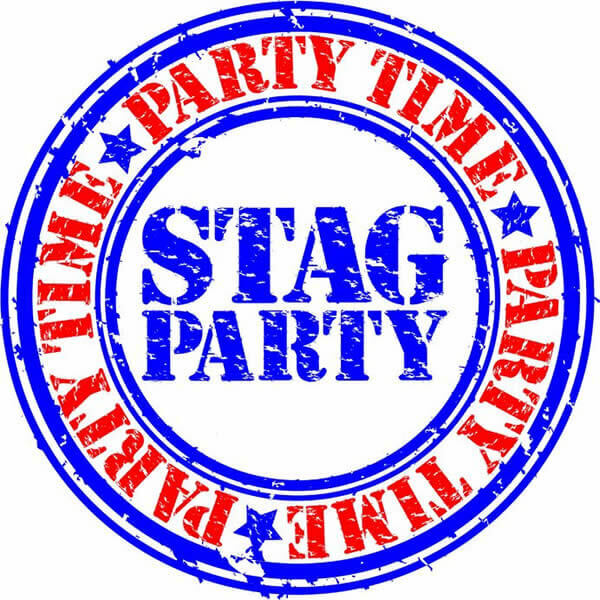 By following these ideas you will definitely have a stag party to remember. This is your first, and let’s hope your last bachelor party. How in the world could you possibly know how to arrange it or anything? Don’t worry, that’s perfectly fine. Why? Because that is the job for your best man. By that, I don’t mean “I know him for years, he’s ok.” NO! Your BEST MAN is the man who knows how you think, how you talk and how you breathe. It is that one friend which you could, without thinking, ask to help you bury the body of a person you killed, and be sure that he will be glad to help you (don’t have any funny ideas now, this is just an example!). T his gets harder proportionally to your years. So the best thing would be to get married at 16 while you have the same friends since your middle school – you won’t have to stress about this at all. Jokes aside, the main rule is: if the person is going to make your party great – invite them, if not – leave them behind. Stag party happens once and it has to be super fun. If you think you will feel bad because you didn’t invite some people, take them out some other day at a local pub for a beer and your job is done. It all depends on you and the group, but the golden rule is: if even one mate can’t afford it – it is too expensive. The biggest expense will probably be the booze, and you have to make sure that you get the money on time. Since this is something that needs to be booked/arranged at least few months in advance, be strict and have a “pay __$ by the __ date, or manage it yourself” policy. It may sound harsh, but you have to think of yourself; they are your mates, but you don’t need to go bankrupt because of them, right? If you think you are too soft and that you won’t be able to do it that way, tell some of your mates to collect the money for you. With all this being said, let’s get to the ideas, shall we? First of all, when enough guys chip in, it is a lot cheaper than a hotel, and second, you will have a feeling like you are in “The Wolf of Wall Street” movie with Leonardo DiCaprio. It really gives you that Old School vibe. Oh, and let’s not forget that nothing will increase the chance of the groom vomiting (the goal of the party) like this will. Now, unless the party is the night before the wedding (which should never happen! ), feel free to drink until you all pass out. Yes, they are super cool – but we have a special proposition for you: make everyone wear the same costume, like for example Smurfs. Everyone comes in white overalls, with white hats and blue paint all over their bodies. It will be trippy, crazy and funny as hell. Especially when all of you get drunk. Careful, do not read this in front of her if you want to live! Of course, you would never cheat on your sweet princess, it’s just that, sometimes, a man needs some time alone with the guys – some “Hangover the movie” time. Grab tickets to Las Vegas, Cancun etc. and spend 3 sleepless days and nights partying, drinking and having fun. Not only will you have the best time of your life, you will also become sick of partying once and for all – which is great since you are getting married now fella. If you and your mates are gym freaks, and just enjoy spending time in the gym, why wouldn’t you have a party in the gym? Ask the owner to rent it to you for one night and all of you come dressed in bodybuilding apparel. You can have tonnes of competitions, like: who does the smallest number of pushups has to drink 2 bottles of beer in 2 minutes etc. Whatever you do, make sure that you clean everything afterwards. Options are countless. Wine, whisky, beer etc. Although this option isn’t cheap, it is super cool. Arrange a “tasting” at a local bar and enjoy many different ways to “taste” your favourite beverage and also maybe even learn something new. My personal advice is, if you like whisky, definitely opt for it because in the morning you will feel totally hangover-free (it is the beauty of this manliest beverage of all). Can you imagine how gentlemanly you guys will feel while you are slowly becoming drunk like pigs? The feeling is priceless, trust me. That would be it. I hope I helped, and I wish you guys to have an unforgettable bachelor party together. Stay tipsy and enjoy life.